You know that guy who orders the fish at a steak place, or the burger at a pizza place? I am not that guy. I like the odd things on the menu just fine, but I like to go for the core competencies most of the time. Checking out the falafel truck? I get the falafel. Given this, there is no earthly reason why I would order a sandwich off the breakfast menu from the crepe truck at lunchtime. But I did. And they screwed it up. And it was amazing. And I will order it again. The sandwich – the only one on Paris Crepe’s menu although it’s not on their website menu – is called l’alternative, which I suppose makes sense at a crepe joint. It’s sharp cheddar, a fried egg, arugula, and bacon on some kind of rustic white bread. More or less a breakfast sandwich, not that there’s anything wrong with that. It was well-toasted but it had gotten a little soggy on the bottom. They left off the bacon, and the other ingredients were spilling over the edges of the bread. It was a hot mess. Lots of cheese sandwiches talk about sharp cheddar. Most of them are faking it. This sandwich is serious as the heart attack that it could ultimately cause. The cheddar is sharp and tangy like a macbook air that’s been in a barn and melted like a mixtape on a sunny dashboard. It’s not even officially a cheese sandwich and it’s the best cheese sandwich I’ve had in a long time. 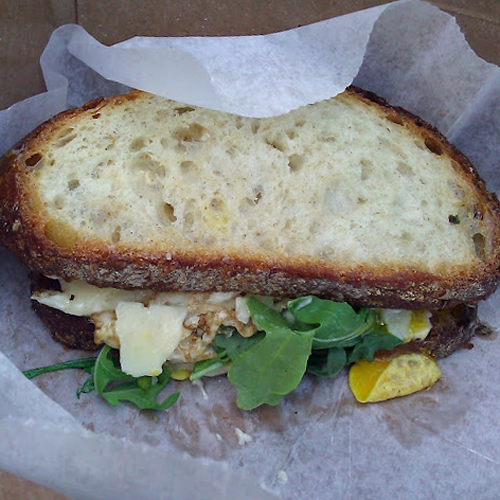 The arugula is a nice touch, offsetting the salty greasy nature of the egg and cheese, but not too much. The bread is crusty and just thick enough, not over-buttered or too crunchy to enjoy. I’ve heard there are whole trucks devoted to the art of the grilled cheese sandwich. I dare them to come down to City Hall Plaza and best l’alternative.